Vladimir, resident of Trial Farm Village in the District of Orange Walk is currently the Manager at La Milpa Lodge within the reserve called Rio Bravo Conservation and Management Area. Vladimir has been working with Programme for Belize for the past 17 years and has extensive knowledge of birds, plants and conservation issues affecting the Belizean flora and fauna. Vladimir became interested in in nature after working as a research assistant with Birds Without Borders where he learned how to identify and band birds. He then moved on to work as a tour guide at La Milpa where his knowledge and passion for the Belizean nature flourished. Vladimir also worked for a year as guide at the now famous and conservation-minded Black Rock Lodge in the Cayo District. His knowledge and passion for Belizean nature has taken him to almost all corners of the country where he has been exposed to the challenges that this young, but naturally blessed country has to offer. His goal now is to inform and educate as many of his fellow Belizeans on the issues affecting their natural ecosystems and to rally support behind the efforts that are needed to combat such threats. Ryan has been conducting wildlife research since an early age and his passion for wildlife science has continued to grow since. Ryan has been teaching at De Anza College in the Kirsch Center for Environmental Studies since 2008 where he teaches twelve different courses and is is the Program coordinator for the Wildlife Science Technician Program where he heads up the research efforts. Ryan has a Bachelor of Science in Wildlife, Conservation Biology and Fisheries with a specialization in Ornithology from the University of California at Davis and is currently in a Graduate Program at San Jose State University. He has spent over 12 years conducting research in Central America, as he lived in Belize for three years as a Field Biologist for The Peregrine Fund on the Harpy Eagle Restoration Project. Ryan is the Executive Director and Founder of the Belize Raptor Research Institute, which is dedicated to protecting and learning about birds of prey in Central America. Ryan has conducted research on a wide-variety of species and habitats, many that are listed under the Endangered Species Act. He is also a raptor bander at the Golden Gate Raptor Observatory as part of their long term research program. Ryan has worked on many field research projects and has spoken at many professional conferences and events, as well as has published scientific papers related to ecology. Ryan is Director our the Hawk Watch Project and Raptor Certification Program. Charles splits his time between Belize and New Mexico working as a Biologist. After receiving his Bachelor of Science in Biology from the University of Texas, Charles worked as a Research Science Assistant for the Texas Army National Guard. In 2005, he moved to New Mexico to work on the White Sands Missile Range for The Nature Conservancy. In 2007 he entered the arena of private consulting to lead an avian survey of Gray Vireos on Ft. Bliss in New Mexico. In 2011, Charles received his Master of Science in Wildlife Science at New Mexico State University on the habitat being utilized by Scarlet Macaws and the effects that this has on nest survival in Belize and Guatemala. In 2011, Charles founded the Mesa Ecological Services where he conducts avian and floral surveys for threatened and endangered species. Currently, Charles is working on the protection and conservation of Scarlet Macaws in the forests of Belize and Guatemala, as well as conducting a country-wide survey on the endangered Yellow-headed Parrots in Belize. Roni, a native of Belize, worked as a natural history guide at Blancaneaux Lodge in Belize from 2004 until 2009. It was there that he developed a passion for birds and other wildlife, as well as conservation. 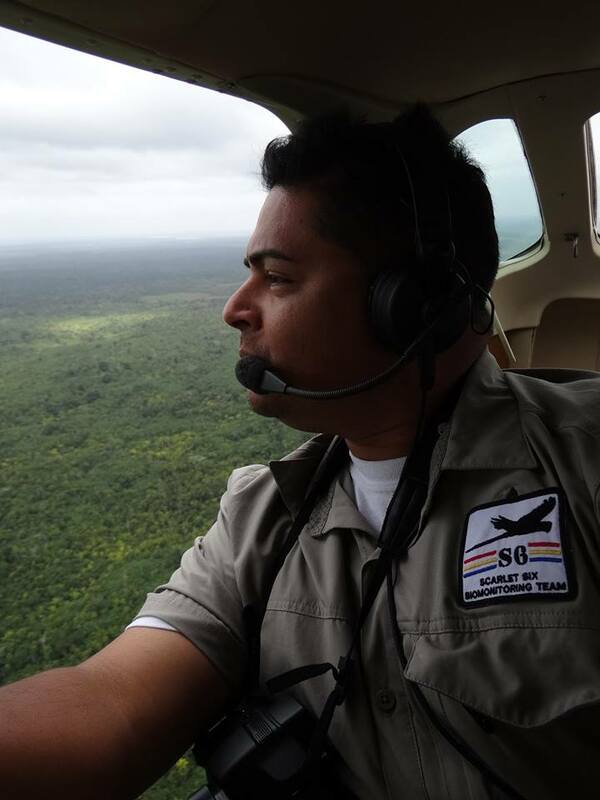 In 2009, Roni became Blancaneaux’s first Conservation Officer and the first for Belize. As a result of this position, he worked along with many different researchers and conservation NGOs who share the same vision. Currently, his work involves research and collaboration on several projects related to birds with numerous organizations including Belize Audubon Society. Roni served as the Belize Raptor Research Institute's President from 2010-2016. His work with other conservation organizations has been crucial in maintaining a proactive effort in conserving biodiversity in Belize.